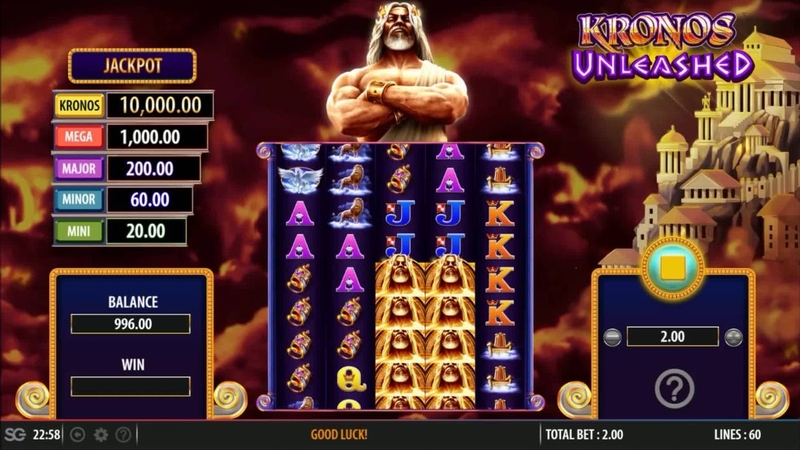 Kronos Unleashed slot from WMS is the follow up to one of their all-time classics - Kronos. 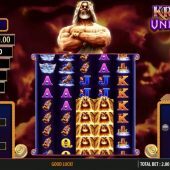 Based on a mythical story of the King of the Titans this 5 reel game has 8 rows and up to 100 paylines. The styling and layout looks to be designed for mobile play in portfolio mode with its tall and narrow shape. Kronos sits above the reels and comes into his own in the features. The Lightning re-spin bonus feature is activated with a stacked Kronos on reel 1. This activates re-spins with more Kronos symbols and chances to win extra re-spins or multipliers. There is also a jackpot feature that offers you a chance to pick up 1 of 5 fixed jackpots, with the biggest being 50,000 coins - similar to Wishing You Fortune. The game also includes a Free Spins bonus feature with up to 75 free spins available. This game is a very poor follow up to WMS' legendary Kronos with limited opportunities to win anything of any notable size. I strongly advise you to give this game a wide birth as their are plenty of other slots other there that are much more entertaining. Just in this genre alone there is Age of Gods Furious 4, Zeus God of Thunder and Pegasus Rising to name a few.